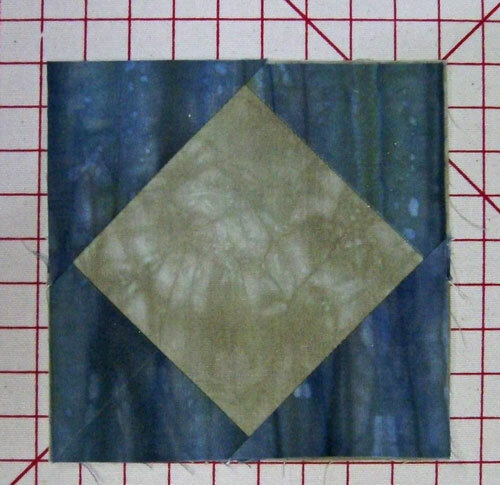 The Square in a Square quilt block—sometimes you'll hear it called a 'diamond in a square'— is a versatile little unit. You see it in so many quilt blocks, like the Storm at Sea, a Mrs. Brown's Choice or in the center of a variable star. And it's makes a terrific little baby quilt when alternated with nine patch quilt blocks. The problem is, that for such a cute, simple, little thing, it's a bugger to piece with traditional rotary cutting techniques because the math gets wonky. But we'll save THAT discussion for later...if you're interested. For now, let's learn how to piece this little patchwork gem. These tried and true techniques get the job done without the mental, math gymnastics! 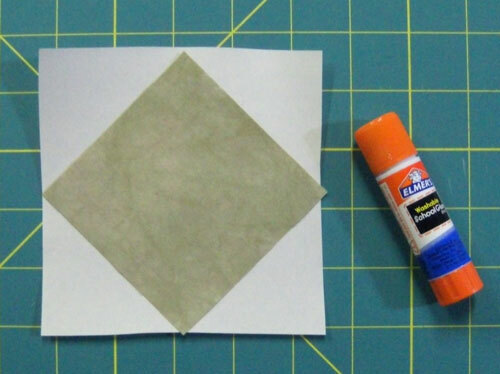 The first is 'connector corners' (which you may have already used for a Snowball quilt block). The second is paper piecing (my personal favorite) with several sizes of the Square in a Square quilt block available as a free downloads. First up is a method for a Square in a Square block that uses the 'connector corners' technique. 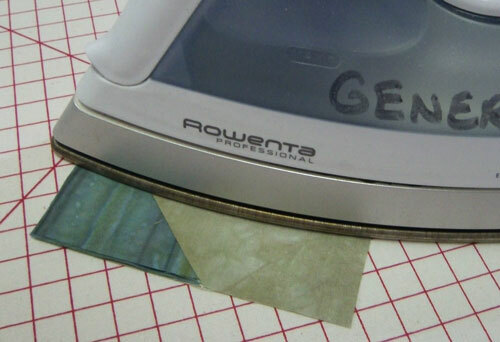 No special tools or rulers needed—just a standard rotary cutter, ruler, mat and marking tool. And best of all, there's no funky math. 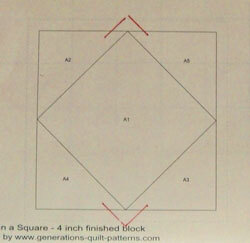 Choose the finished size for your Square in a Square quilt block or unit. 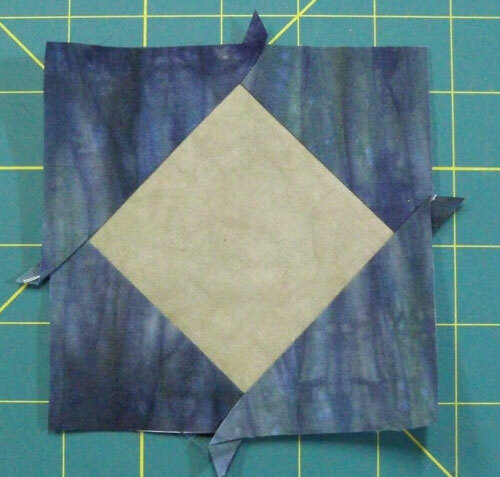 Cut the center square fabric equal to the finished block size plus 1/2" (for seam allowances). 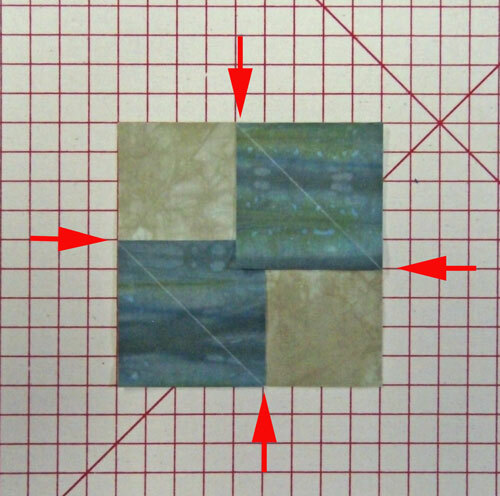 Cut four corner patch fabrics equal to the finished size of the block divided by 2 and add 1/2" for seam allowances. 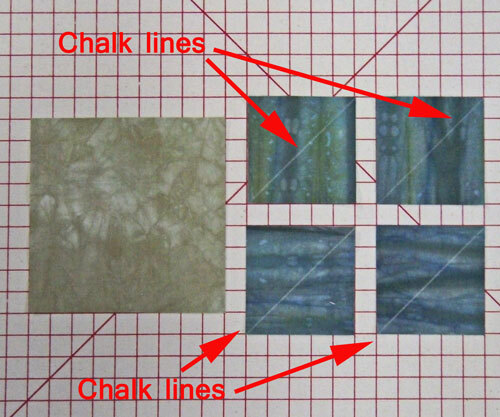 On the back side of each 2-1/2" blue stripe square, draw a diagonal line from corner to corner. Chalk or a light touch on a graphite pencil both work well. You need a line just dark enough to see. Notice that if the stripes are to end up going the same direction that two are marked with the stripe running up and down; two are marked running left to right. 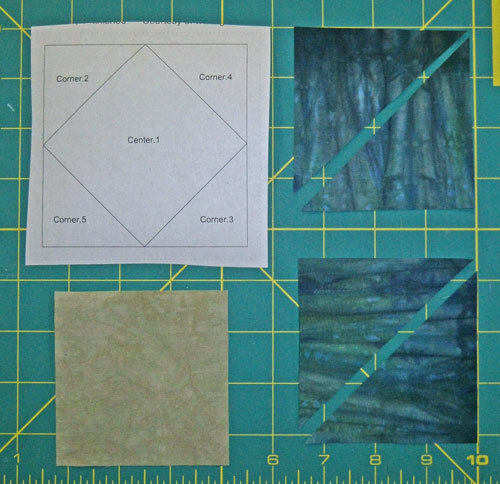 Layer a 2-1/2" square in two opposite corners of the 4-1/2" square. The ends of the diagonal lines touch the outside edge of the larger patch (at the red arrows). Pin if needed. Sew on each line. Press the unit flat to set the seam. 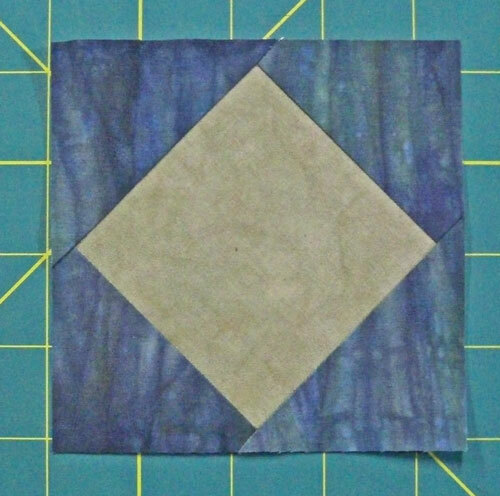 The blue corners should meet the edges of the 4-1/2" square. If they extend past the edge of the 4-1/2" square, trim where necessary. 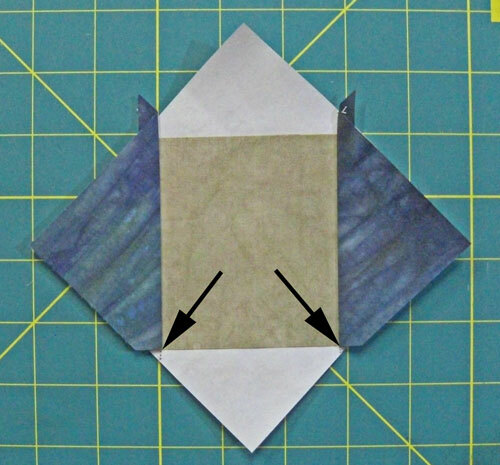 If the corner patches meet the edges perfectly you can either trim the excess middle blue layer AND the taupe layer to a quarter inch seam allowance or just trim the middle blue layer. There are two schools of thought on this. Many quilters trim away the excess from the smaller square. I do this because the original 4-1/2" square was cut the exact size needed. Sometimes my sewing on the diagonal isn't as 'exact' as it should be. Leaving the larger square intact means that the sewn unit will be correct regardless of my sewing skills. 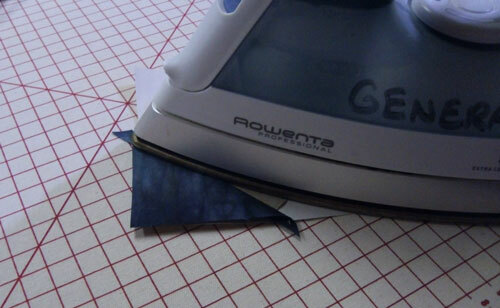 If you choose this method your seam allowances can only be pressed away from the center square. Other quilters choose to remove both the excess taupe AND blue fabric to reduce bulk, especially if the quilt will be hand quilted. An added benefit of removing both layers is YOU control the direction the seam allowances are pressed. Layer the remaining squares in the open corners. Stitch on the drawn lines. Press the square towards the corner. 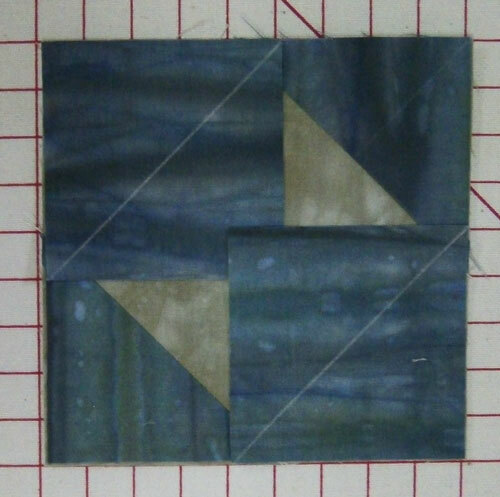 Again, check how well the edges of the blue and taupe squares align. Trim as needed or desired. Trim seam allowances as needed or desired. ...and your Square in a Square quilt block is finished. Beautiful! 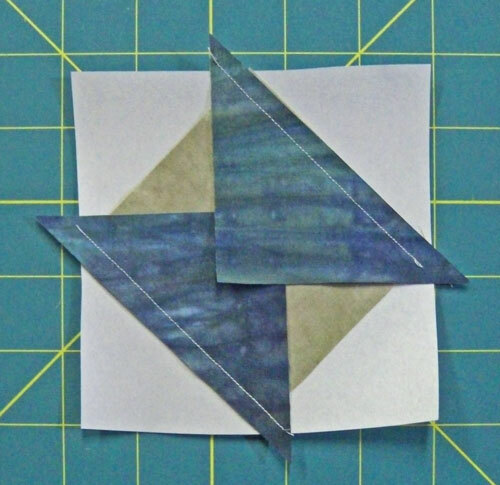 This is a terrific little unit to practice your paper piecing skills. Since there are so few pieces, you can get by with using paper from your home printer if you need to. Nothing special to buy! You'll need Adobe Reader (the latest version is recommended) installed on your computer in order to open and print any of these square in a square quilt block patterns. You can get Adobe Reader here (a new window will open so you can download it without leaving this page). 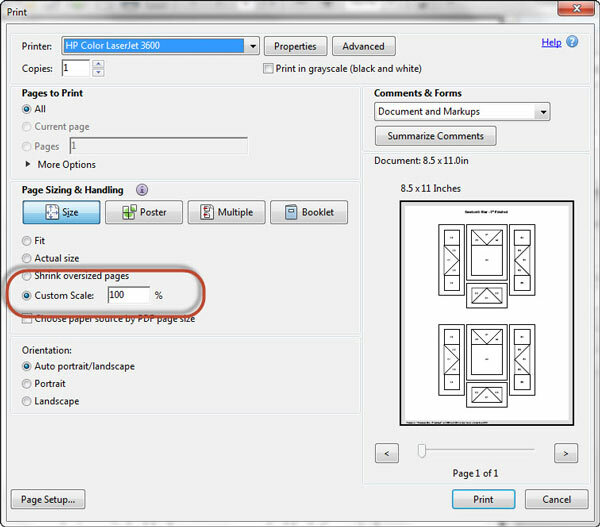 To print blocks at the correct size, under 'Page Sizing and Handling' in the Adobe print menu, set 'Custom Scale' to 100%. Click here to see what it looks like on an Adobe Print Menu page. Cut your printed pattern into individual blocks--there's no need to make it pretty--a rough cut will do. The patterns are marked with either 'Center' or 'Corner', followed by a number. The word refers to the fabric choice; the number refers to the order of piecing. To prevent stretchy edges, you want the outside edges on the straight of grain for stability. 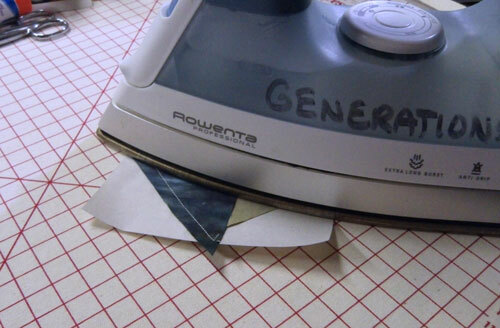 The easiest way to do this is to precut your fabric into patches. The fabric requirements below are for constructing a single block. 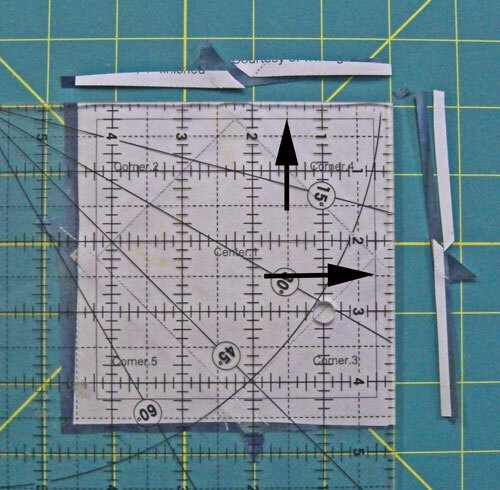 Center 1 1-7/8" 2-5/8" 3-3/8"
Corner 2 2-3/8" 2-7/8" 3-3/8"
Once all your squares are cut, cut the two corner squares in half diagonally as shown above. A striped fabric is used for the corners. To get those stripes all aligned in the same direction in the finished block, one patch is cut diagonally with the stripe running up and down; the other is cut with the stripe running from side to side. Reduce your stitch length to 15-20 stitches per inch. It may be easier to remove the paper if you use a larger needle, like a 90/14. I generally use the needle already installed in my machine (usually an 80/12 or 70/10) when using paper made specifically for paper piecing and have no problems removing the paper. On the unprinted side of the paper, align the center patch fabric so that the pretty side shows. I like to use a tiny dab of Elmer's Glue stick (the kind that goes on clear and dries purple) to hold this patch in place. You could also use a pin or Scotch Brand Magic tape. 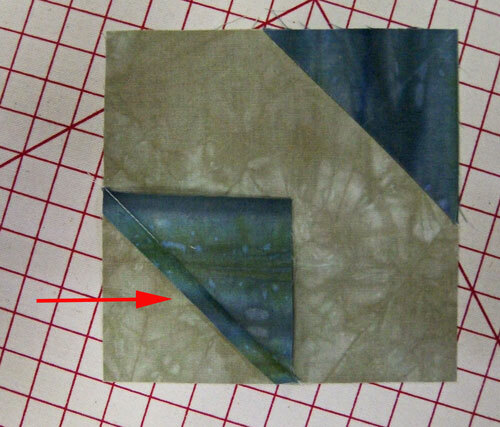 The edges of the square should extend about a 1/4" past the solid lines on the other side of the paper. You should be able to hold this up to the light to line things up. Marking two corners should provide an adequate guide for placement. 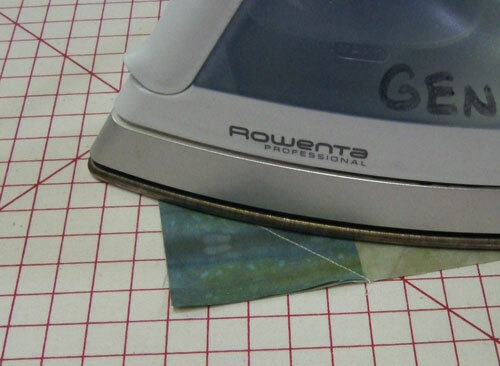 Align the long edge of a corner triangle, RST(right sides together), with one side of the fabric square. Turn the square over to the printed side and stitch along the line between Center.1 and Corner.2. 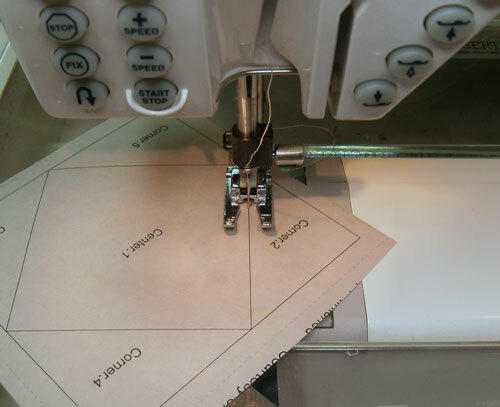 Start stitching about 1/4" before the printed line begins and stop about 1/4" after the printed line ends. The next line of stitching will cross it and secure your stitches. ...and now with the patch pressed open. Double check to make sure you haven't accidentally pressed a tuck into the seam allowance. Trim the points (aka 'dog ears') to clean up the unit. In the picture below the lower dog ears have been trimmed; the upper ones need to be. If you need to repair torn paper, use Scotch Brand Magic tape. (It perforates nicely when you stitch through it.) Don't iron directly on it. Add the remaining triangle patches in the same manner. A PERFECT Square in a Square quilt block EVERY time! Ready for another block? 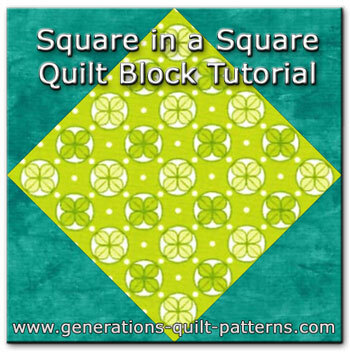 Check out our Free Quilt Block Patterns library for another!